At hypersonic speeds the value of d is almost constant, ranging between 0.55 and 0.60 from the Second Law analysis [Builder, 1964]. That means that as speed (V) is increased, the specific impulse must decrease with increasing speed. Figure 4.19 shows three 7sp values, decreasing from upper left to lower right. The top solid line is for an ideal engine with no internal losses. The middle solid line shows the Isp from Builder's analysis including the losses from Swithenbank's injector system (Case 0, Figure 4.4). This is the value of the Isp if the vehicle were in cruise mode; that is, thrust equal to drag, with no acceleration. The bottom solid line shows the effective or acceleration Isp based on engine net thrust minus aircraft drag; this is the Isp for an accelerating aircraft that must have thrust greater than drag. If there is no acceleration (that is, thrust minus drag is zero) then the value of effective Isp is zero. The gray band is the sizing breakeven Isp for a hydrogen/oxygen rocket and a hydrogen fueled airbreather. Since the bulk volume of 100 kg of 6 to 1 liquid oxygen-hydrogen is 0.26 cubic meters, and that of 100 kg of sub-cooled liquid hydrogen is 1.34 cubic meters, the breakeven Isp is a function of volume and Isp together. As Mach 12 is approached the propulsion system efficiencies become similar. That is, the propellant masses required to achieve a unit change in velocity are equal. For some airbreathing systems, the rocket propellant mass required to achieve a unit change in velocity is less than for the airbreathing system and so the volume requirements for the rocket propellant is about one-fifth that for the airbreather system. For the Swithenbank injectors that breakeven speed is Mach 15.0. However, at the breakeven speed the airbreather is just equal to the rocket, and even if no higher speed is sought, a higher Isp is always welcome. That higher Isp comes through system thermal management. The impact of thermal management is illustrated in Figure 4.19 by the four dashed lines for the specific impulse of the thermally integrated system. The temperature of the injected hydrogen is given in Kelvin. As the injected fuel temperature increases, the injected fuel energy offsets a greater fraction of the internal drag losses. If the injected hydrogen temperature can reach 1,094 K (1970° R) then all of the internal drag losses generated by the Swithenbank injector concept have been eliminated (in fact, compensated for). The airbreathing engine energy and entropy limitations presented in Figure 4.7, are still in effect. At Mach 15 flight speed, the effective Isp can be increased by over 600 s. It requires a detailed engine analysis to quantify a specific value for a given system, but the general trend is correct. Recovered thermal energy can be converted into useful work and thrust to increase performance [Ahern, 1992; Barrére and Vandenkerckhove, 1993; Novichkov, 1990]. 9. 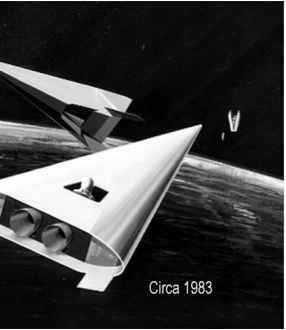 Ejector ram-scramjet-rocket. Figure 4.20 is an ejector ramjet thermally integrated with a rocket. The ejector may be a hot gas ejector and/or a rocket ejector. Remember, if the ramjet is a subsonic through-flow engine, then the scramjet is simply a supersonic through-flow engine. The maximum airbreathing speed can be selected to be from Mach 6 to at least Mach 14.5. At Mach less than 2, the system is an ejector ramjet analogous to a ram rocket system, except the rocket ejectors are distributed in the struts inside the ramjet engine module [Stroup and Pontez, 1968]. At Mach number greater than 2 the engine is a conventional ramjet with the rocket injectors now functioning as hot hydrogen injectors. Subsonic thrust is generated in the same manner as a ramjet, and the supersonic hydrogen injection acts as an aerodynamic isolator. Above Mach 6 it is a conventional scramjet engine with variable configuration injectors to minimize internal drag as discussed earlier in this chapter [Gounko et al., 2000]. rocket community overcame the advantages of airbreathing propulsion and an allrocket solution was adopted in every case. There have always been, and still remain, arguments that scramjets will not work, and that the analogy is with trying to light a match in a supersonic wind tunnel. However, Professor James Swithenbank of Sheffield University has the correct analogy, and that is lighting a match in a Concorde traveling at Mach 2. Both the surrounding air and match are at the same speed if hot hydrogen is injected into the engine via the injection devices and if the airflow velocity and hydrogen velocity can be the same. For the Mach 14 case shown in Table 4.2, the hydrogen injection velocity would be the same as the combustor through-flow speed at a gas temperature of 660°C (933 K, 1,246°F). For a slower Mach 8 case, the combustor through-flow speed is 7,100 ft/s (2,164 m/s) and the hydrogen gas temperature required is a modest 293°C (566 K, 585°F). In reality then, traveling with the air stream, the fuel and air are essentially at static conditions with very little differential speed. So the scramjet is like lighting a match on Concorde. When one of the authors (PC) was a young engineer at Wright Patterson Air Force Base he was assigned as Chief Engineer for the High Temperature, Hypersonic Tunnel at Hypervelocity Branch, Aircraft Laboratory, Wright Air Development Division. The High Temperature, Hypersonic Tunnel was a nominal Mach 4 wind tunnel heated with a Zirconia pebble bed. Nominal air temperatures were in the range 2,500 to 1,500 K (4,500 to 2,700 R). The pressure, temperature, and velocity in the test section were very close to those of a scramjet operating at a Mach 8 flight conditions. The Aero-Propulsion Laboratory assigned Paul Ortwerth and then, Squadron Leader E. Thomas Curran to investigate the possibility of testing a scramjet combustor in the High Temperature, Hypersonic Tunnel. Squadron Leader Curran was familiar with the work Professor James Swithenbank was doing in a similar facility in Montreal, Canada. The result was an experiment that used the test section of the High Temperature, Hypersonic Tunnel as a scramjet combustor. A 7.6 cm wide flat plate model 19 cm long with five hydrogen injection ports placed one-fourth of the model length from the model nose was placed in the 12.7 cm test section [Burnett and Czysz, 1963]. The model was installed on an injection system, so the duration of the time in the test section could be controlled. There were a series of pressure taps running down the model centerline. The gas plenum chamber in the model was equipped with thermocouples to measure the hydrogen temperature. Both color Schlieren and infrared cine; film recording of the flow field were made. The infrared film was filtered to center on the high-temperature water emission radiation. Figure 4.21 (see the color section) shows two of only a few surviving photographs from the test; all of the original cine film was burned to recover the silver. The left picture is a color Schlieren with a horizontal knife-edge, so above the model red indicates a reduction in density, and green/blue an increase in density. The shock waves from the model and gas injection are clearly visible. The red hydrogen injection is also clearly visible. The model plenum chamber thermocouple gave a hydrogen temperature of 300°C ± 15°C (573 K ± 15 K) so the test section air and hydrogen speeds were very similar. From Table 4.2, the 7,100 ft/s test section speed corresponds to a flight speed of 8,000 ft/s as does the 2,500 K stagnation temperature. The picture on the right is from the infrared film camera and clearly shows the water formation approaching the hydrogen injection holes. So combustion delay was minimal. Professor Swithen-bank's data correlations for over 1,000 test runs give a time to complete combustion of 35 ± 5 microseconds for gaseous fuels; at this airflow speed the distance traveled is about 2.98 inches ± 0.4 inches (6.6 to 8.6 cm) and is very close to the data from the pictures. A later analysis showed a very close correlation between the schlieren and infrared pictures and confirmed the combustion distance from pressure measurement [Czysz, 1993b]. So indeed hydrogen will burn very well in a scramjet.